(Newser) – With Prince Philip stepping back, Prince William is stepping up. William took off on his final flight as an air ambulance pilot Thursday as he prepares to take on more royal duties, reports NBC News. 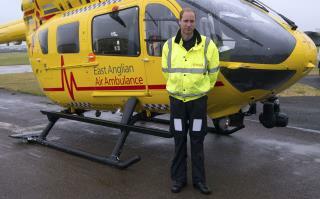 Writing in the Eastern Daily Press, per the Evening Standard, William said his experiences with East Anglian Air Ambulance "have instilled in me a profound respect for the men and women who serve in our emergency services, which I hope to continue to champion even as I leave the profession." Good old potential King Billy. Unfortunately, when the Old Girl kicks off we will be stuck with his dad, who will more than likely outlive me. Darn. I am glad the royals are allowed to do a few things they like before being forced to take their royal responsibilities. I sure would be unhappy, but I know there must be a reason for everything. And I'm SURE he flew the deadliest missions...... err: Like my dad in Vietnam ?! **Which, by the way, didn't get me into chopper school . . . .